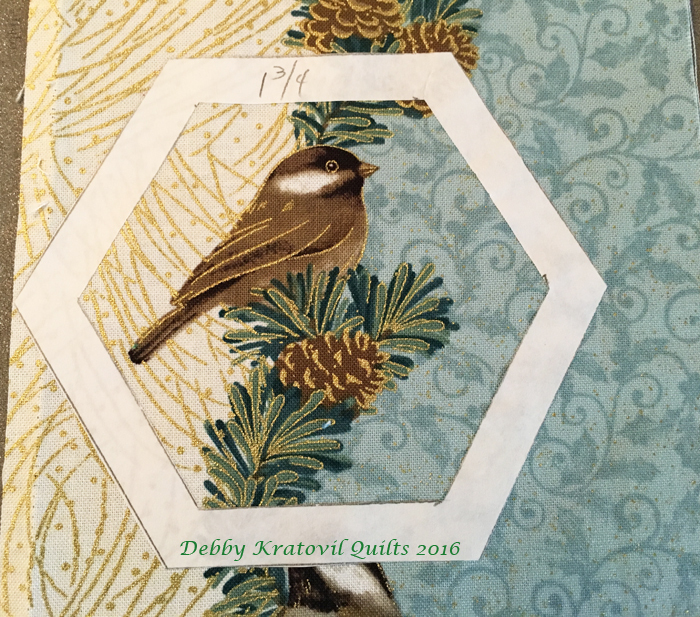 Today Debby from Debby Kratovil Quilts is playing with Jackie Robinson's My Little Chickadee fabrics. And she's using hexies! I wanted to fussy cut those little birds. I wanted them to be the star! I thought of a previous blog post using some "birds". They are actually chickens (they're birds, right?) Do you remember this? 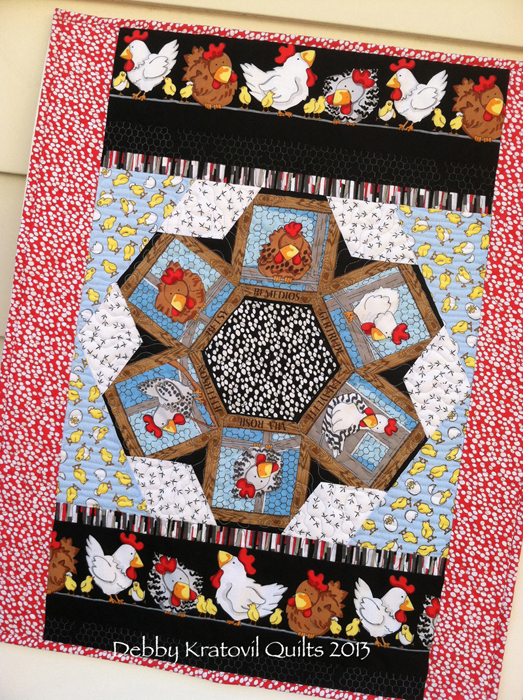 It was called Boogie in the Hen House with No Fowl Play (the collection is called Fowl Play). 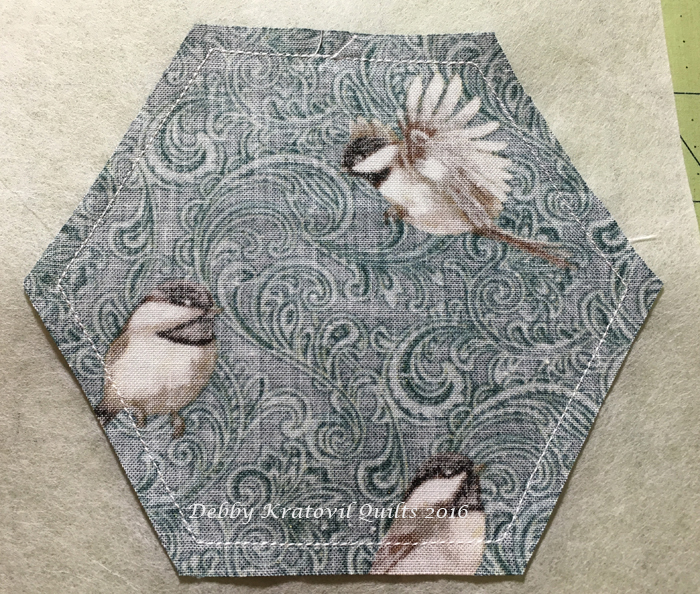 I set to work fussy cutting 6 little chickadees. I cut a freezer paper template so I could isolate the chickadee before cutting it out. The height of my template is 4-1/2". The image will finish to 4". 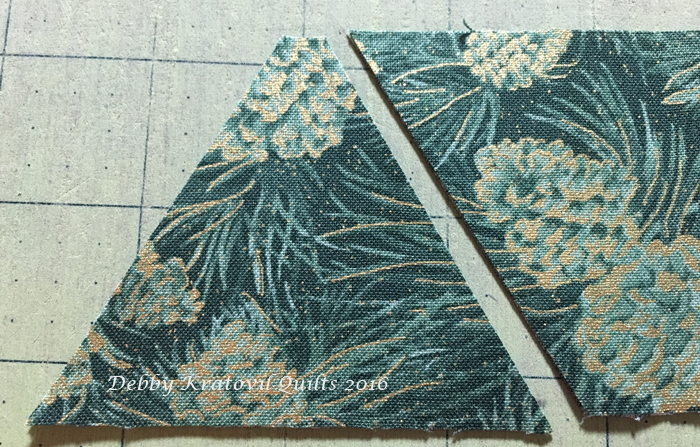 Then I cut a 2-1/2" strip of the green fabric and cut 60 degree triangles. I used a multi-sized 60 degree ruler. 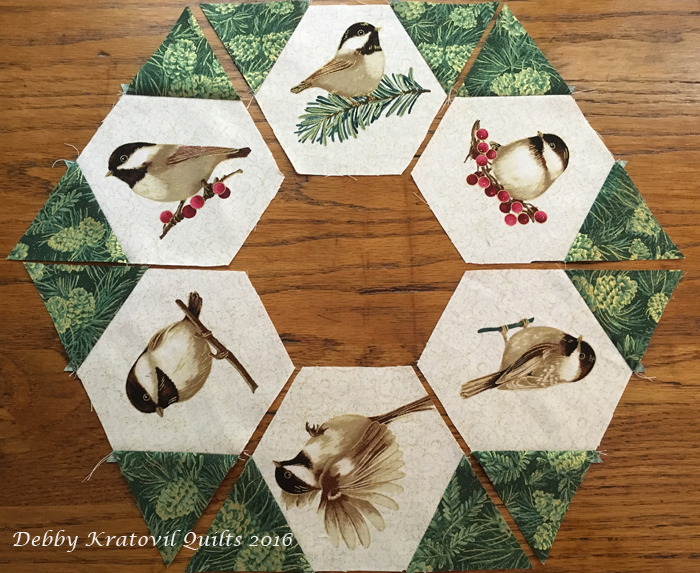 (I have shown how to cut these - and the hexagons - in a previous post). 60 degree triangles; will finish to 2" in height. 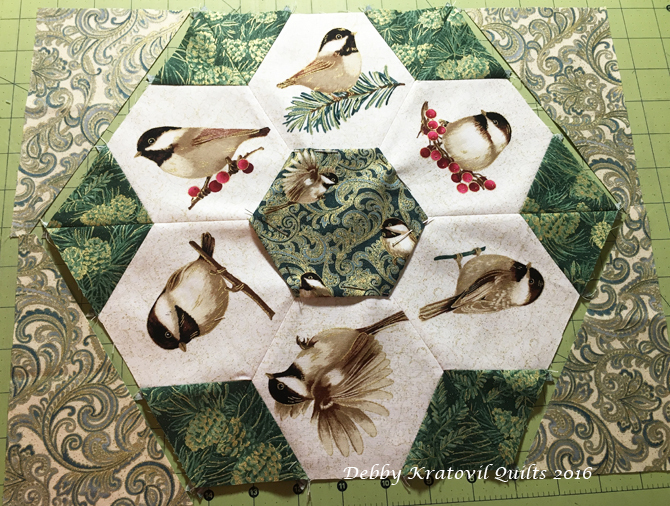 With 6 chickadee images and 12 green triangles, here is my next step. 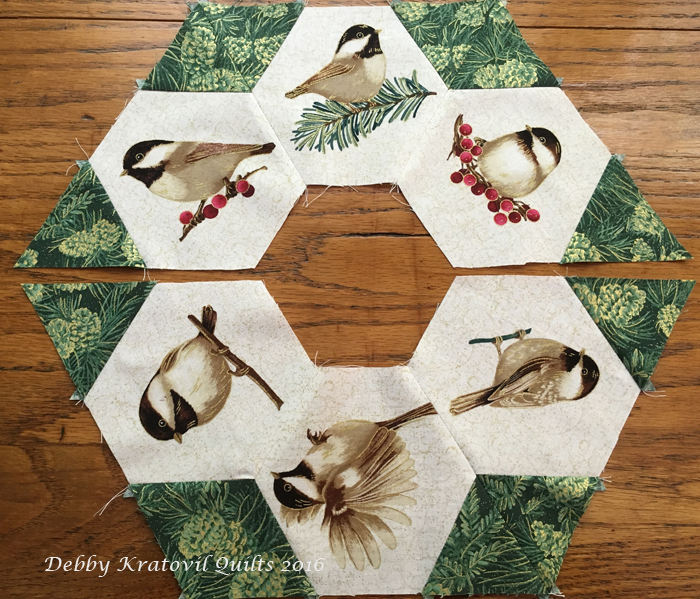 I sewed two triangles to the side of each chickadee hexagon (it REALLY helps to lay things out on your table or design wall so you can keep things straight). But if you visit the Fowl Play blog post, you will see these steps in more detail. 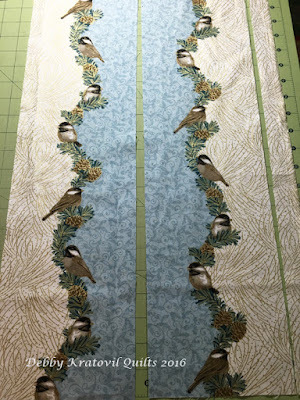 Sew three sets of chickadees together for the top and three for the bottom. Now it's time for the center seam. And we will cut 6-1/2" triangles to square up the sides. Again, this can only be done with a 60 degree ruler. These are 30 degree triangles, btw. So, let's see the parts. The center interfaced hexagon is pinned and ready to be zigzag stitched to the ring. 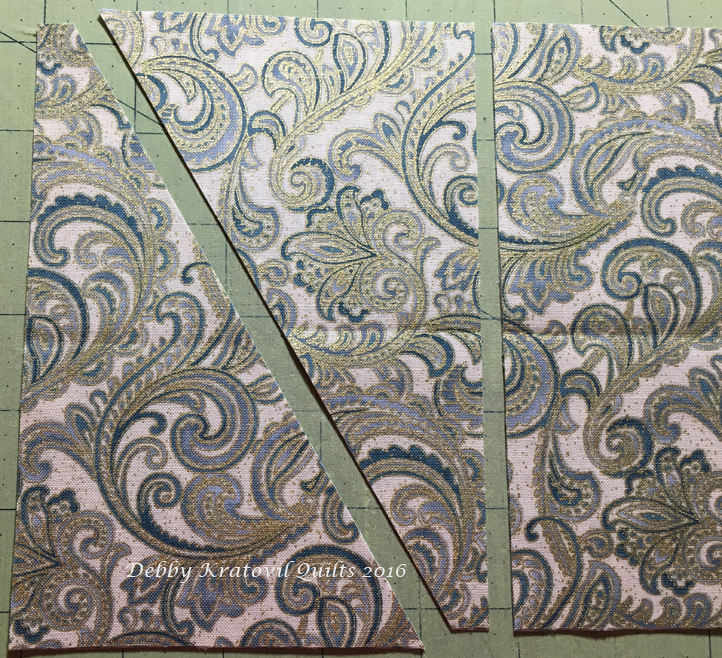 After I do that, THEN it's time to remove the interfacing. I didn't like it. So - yes - I took it off. 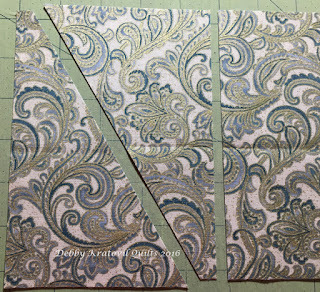 Then I cut four borders so I could make some attempt to miter them. This is the best I could do! I think it's sweet, don't you? 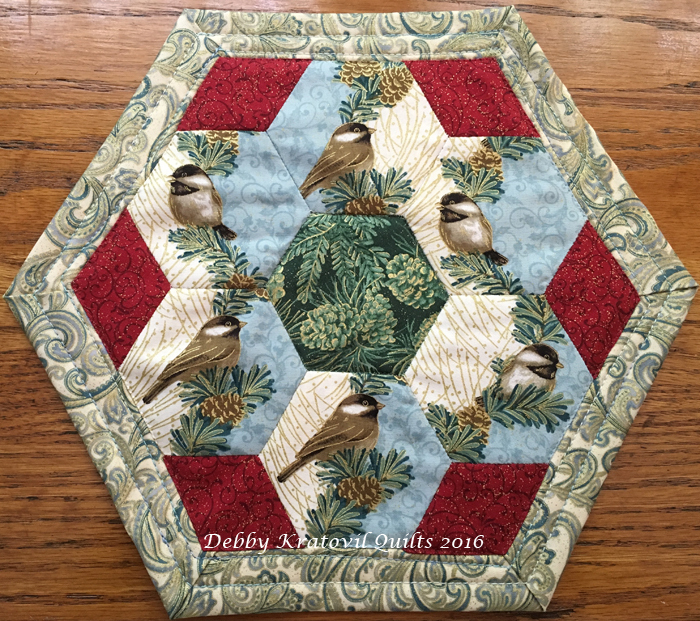 This will be a perfect Winter table topper or wall banner. It's not necessarily Christmas, so it will have a long life. 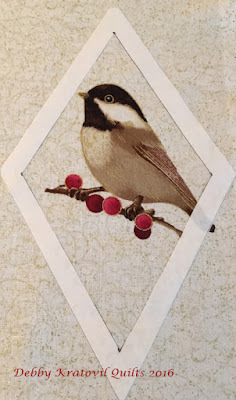 Can I show you just a few other things I made using English Paper Piecing? I used The New Hexagon book by Katja Marek for several of the blocks. 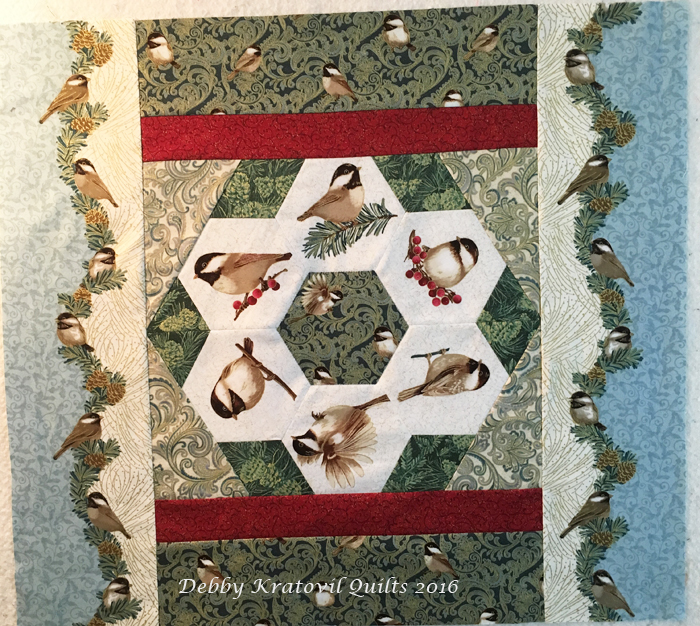 And I finished them into little quiltlets as shown at Katja's Quilt Shop pages. And yes, I fussy cut the centers. Don't you just love them? And there is a brand new perpetual calendar based on The New Hexagon with 366 more blocks! 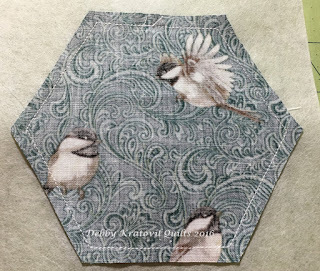 I fussy cut a little chickadee and put him/her in the center of the July 1 block. Yes, I was determined to make the best of that messed up border fabric! I fussy cut 6 birds and used them in a GFG block that includes red diamonds to "square" up the sides. Katja gives this block a name: Judy. I also turned this into a quiltlet. 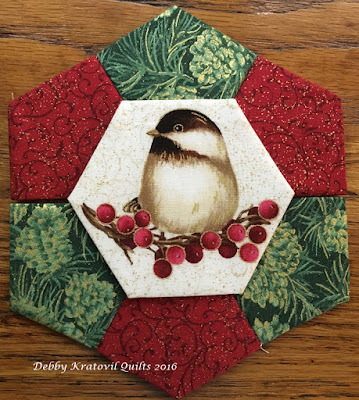 I am still making more of these little blocks. I can't help it. The chickadee fabric inspired me so! Thanks, Debby! 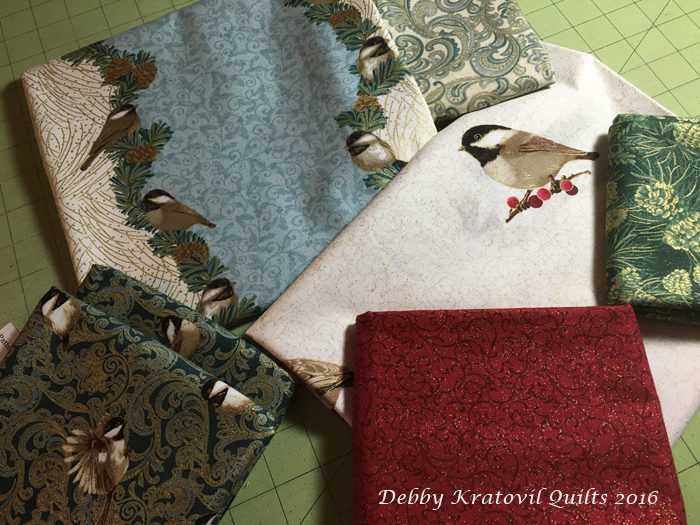 Head over to Debby's blog to enter for a chance to win a FQ bundle of My Little Chickadee fabric! What fun projects! Those sweet birdies deserved every one of the spotlights you gave them! I like that this can be enjoyed during more than just the Christmas season. Those are beautiful and the fabrics are gorgeous. What a cute line of fabric and project! thanks! 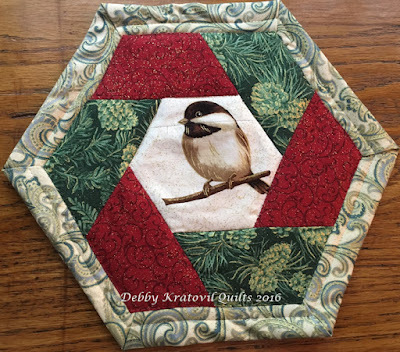 I can see why you were inspired by the chickadee fabric. Chickadees are just too darned adorable. I love everything you did. Thanks for sharing. FANTASTIC!!! 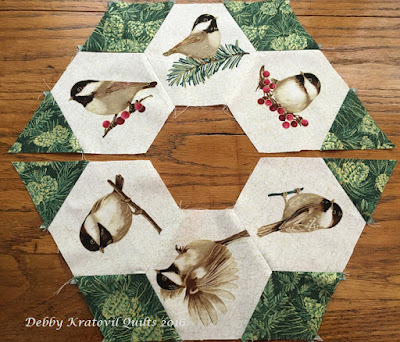 Love the projects and those chickadee's just seem to chirp on the fabric!!! Thanks for the terrifc explanations!!! Woonderful fabric--wanting to fussy cut some of the birds myself! I love everything Debby made, and I agree that this line is so beautiful. Thank you for having a hop on these collections. They are beautiful. This is gorgeous! 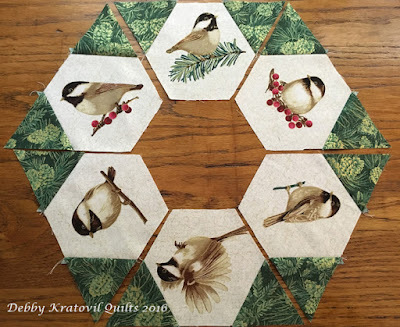 I love the tutorial and am definitely going to be making one of these. Thank you for sharing and have a fantastic creative day! Beautiful project and great tutorial. Debby is spot on as usual. Thanks for the continued information and inspiration! 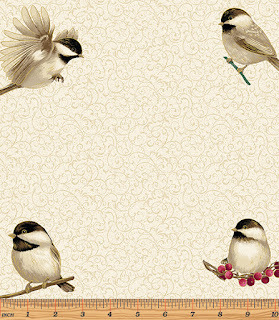 I love the little chickadees and the coordinating fabrics. Your projects are wonderful and I will be looking for the fabric in my LQS. Thank you. Chickadees live in this area. I can just hear that "chick-a-dee-dee-dee,chick-a-dee-dee-dee,chick-a-dee-dee." So beautiful projects and fabrics.The fussy is an eye catching.Great job! 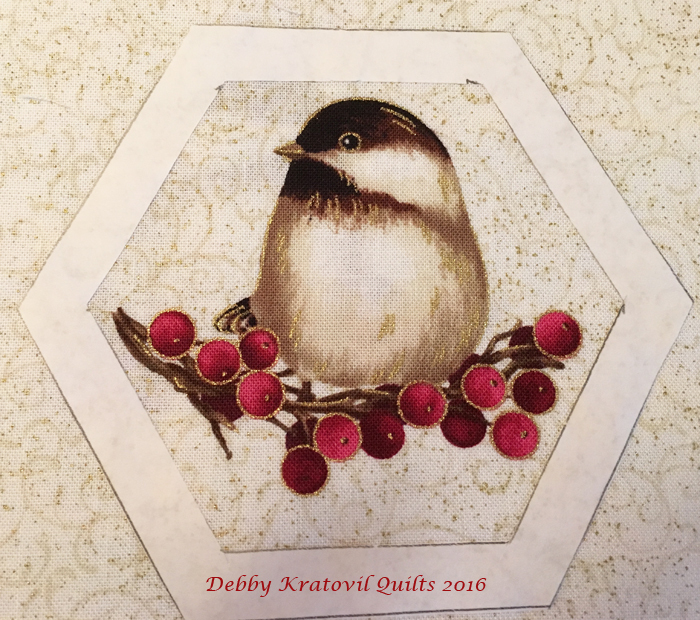 I always love Debby's projects and ideas. They always amaze me. 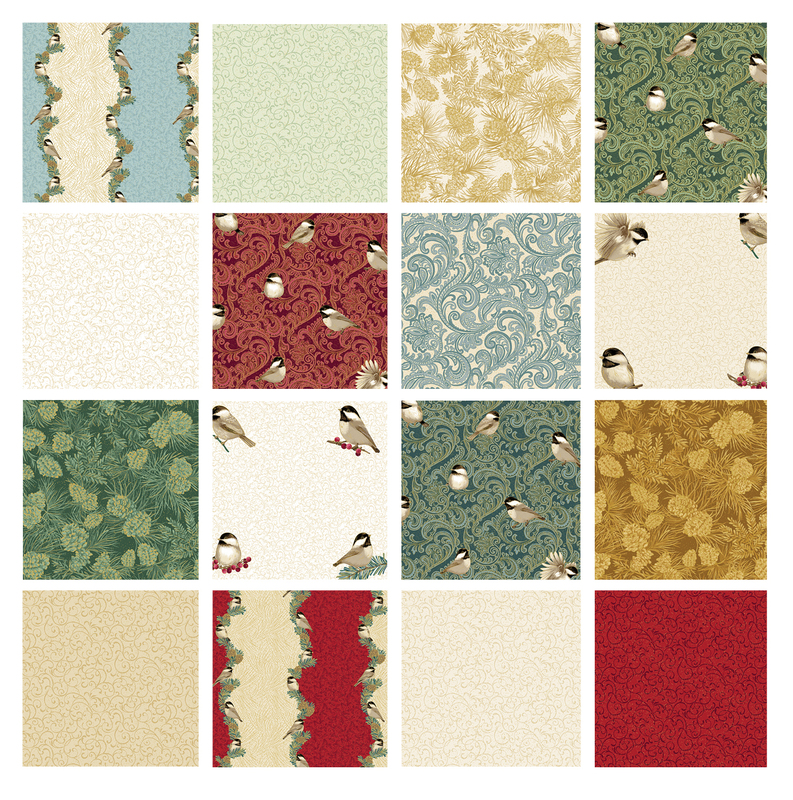 I really love this fabric collection because Chickadees are one of my most favorite birds to watch in the winter. They're just so cute. This is just so beautiful. Thanks for sharing. Oh I love the way you fussy cut those little chickadees. Absolutely beautiful! What a great fabric line. Thanks for showing how you used it. I love the blocks - and the window templates really do the trick! I love this fabric. I usually stay away from this kind of fabric as I never know what to do with it. But would love to try the Hexagon block and the fussy cutting. She really picked things that make the fabric the star. Glad I came by. 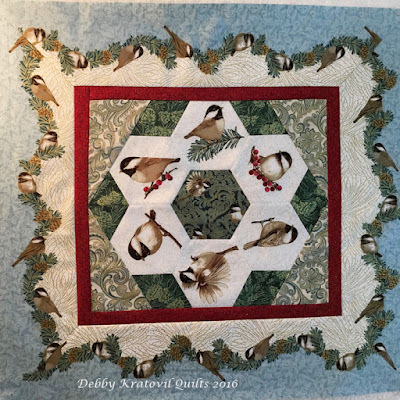 Gorgeous - I love your fussy cut chickadees! I love how you fussy cut the adorable chickadees for EPP!!! I just started EPP and love it! I love watching the chickadees that come to my feeders....my favorite! They don't seem to be afraid of me because they like to hang out near me when I am filling up my feeders. Super adorable and great use of the fabric! How clever those are! Each one as cute as the next!